As a fitness professional, I know how important nutrition is. I am a strong believer in a whole-foods, balanced ‘diet’. I use the term diet meaning anything you consume in a day NOT Atkins diet, etc. For the most part, I eat whole foods and prepare my snacks and meals from scratch. However, we all have days when there is not enough time to properly prepare every meal and snack needed. That is where Shakeology comes in. I have always been a fan of smoothies, and in the last 5 years or so I have started adding protein powder to my fruit smoothies to add more nutrition and to make them a great post-workout meal or meal replacement. At the beginning of this year, I started making an effort to drastically improve my nutrition, cutting out most processed foods and I started eating more veggies than I ever had before. I came to discover that most protein powders have a lot of junk fillers in them. I discovered Shakeology from a friend last spring and instantly fell in love with it. Shakeology is high in protein, but it’s also high in fiber and so many other natural ingredients and nutrition that your body needs on a daily basis. A lot ofpeople nowadays are eating a diet high in processed processed foods, they are not getting all the nutrients they need which causes alot of chronic health problem such as type 2 diabetes. In comparing Shakeology to protein powder think of a salad bar. The protein powder would be the hard-boiled eggs that you put on your salad. The Shakeology would be like going to the salad bar a couple times! When I have Shakeology on a regular basis, it is easier for me to eat healthier all around. It helps kick my sugar cravings and when my brain isn’t clouded with wanting sweets, I tend to crave veggies and other healthy foods. For others who are want to lose weight and need to eat healthier, it can be overwhelming to make all the dietary changes necessary to get results in a short enough period of time to stay motivated for the long run. Shakeology kickstarts those results by being a stepping stone to better nutrition. I get home late from work, too late to make dinner from scratch so Shakeology fits the bill perfectly. Other times, I am low on leftovers to have for lunch so Shakeology helps make sure that I am getting enough calories to stay energized all day. Some people like to have their shake for breakfast. Shakeology is also great meal on the go; you can make it a night ahead and freeze it or make it in the morning and keep it in the fridge until you need it. 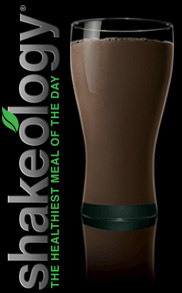 One of my favorite ways to have my Shakeology is mixing the chocolate flavor with banana and peanut butter. A close second would be to mix strawberries and bananas with either the Greenberry or Tropical Strawberry flavors. Everyone likes a little different flavor and consistency so I recommend to anyone trying it out to expiriment with how much liquid you add (milk, water, juice, yogurt, etc.) and if you don’t like it one way, try it another way as there’s hundreds of different ways you can make your shakes work for you. If you already use Shakeology, I’d love to hear about your favorite ways to make it. Please share your favorite recipes in the comments below. If you have never tried it, let me know and I’ll let you know how you can get your hands on some samples. Previous Post:Success Story- Joe B.